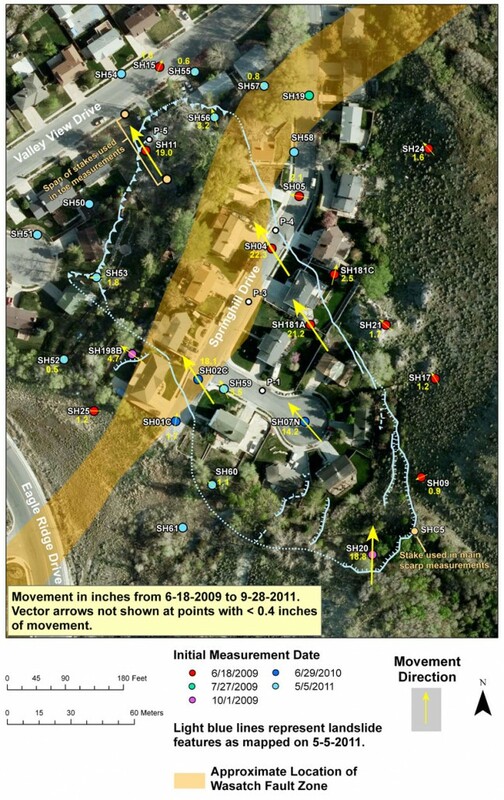 Map showing results of movement monitoring of the Springhill landslide based on measurements for each survey marker from June 18, 2009 to September 28, 2011, using a survey-grade Global Navigation Satellite System (GNSS) instrument. Movement directions (yellow arrows), amounts in inches (yellow text), station numbers (white text), and well locations (white dots) with well numbers (white text) are shown. Also shown are locations of stakes used in deformation calculations (tan dots). Some movement was detected at several stations along the edges of the landslide, outside the approximate 2011 boundary (light-blue line), which we infer was the result of the landslide pushing on rigid elements (such as concrete slabs and foundation walls) and/or possible seasonal soil variations. Shorter dashes indicate greater uncertainty in landslide boundary or feature location. Sawteeth on boundary line show toe of landslide where thrusting of landslide mass has occurred. Sawteeth point in the direction of overriding block. Figure updated on January 17, 2012. Provisional data. Subject to revision. This section summarizes landslide conditions from August 22, 2011 through July 10, 2012. Precipitation for the current water year is also discussed. The Springhill landslide moved very slowly since August 22, 2011, but the rate of movement (the speed at which the landslide moved) was not constant. The landslide has shown a decrease in movement rates since our last update on May 1, 2012. Measurements taken on July 10, 2012 indicate that the main scarp (uppermost part of the slide) is currently moving at approximately 0.0 to 0.2 inches per week, similar to the last reporting date (May 1, 2012). Movement of the toe (lowermost part of the slide) has decreased to less than 0.1 inches per week since the last reporting date (May 1, 2012). This decrease is likely due to below average precipitation in the first part of summer 2012. Total measured ground deformation (the amount that the ground stretches or shortens as landslide movement occurs) since August 22, 2011 is about 0.0 to 0.4 inches across the main scarp. The table below summarizes the total measured ground deformation and movement from August 22, 2011 through July 10, 2012. Small movement rates were observed from August 22, 2011 to July 10, 2012, continuing a significant rate reduction since spring and summer 2011. Rates are expected to stay the same or decrease through the summer months of 2012, due to lower than average precipitation during 2012, and therefore lower groundwater levels. Precipitation at the landslide is estimated using data from the nearby Bountiful Val Verda National Weather Service station, approximately 1.5 miles northeast of the landslide. Precipitation for the 2012 calendar year has been 77 percent of normal. For water year 2011-2012 (October – September), precipitation is 75 percent of normal. Rising groundwater levels can cause the rate of movement of a landslide to increase. Since the last reporting period (May 1, 2012), groundwater levels at wells P-3 and P-5 have decreased slightly, while well P-4 has stayed the same. Well P-1 has been clogged with mud since December 7, 2010, making a groundwater level measurement impossible. All current and historical Springhill landslide groundwater level data can be accessed through the UGS Groundwater Monitoring Data Portal. Users can create custom plots of water level data, download in CSV (comma separated value) format, or a well summary report may be viewed or downloaded in PDF format. Based on continual movement since the beginning of 2010, with normal to above average precipitation, the UGS anticipates continued movement in 2012. However, due to lower than average precipitation levels since late summer 2011, movement has slowed since the latter part of 2011. Based on landslide movement since 2005, the total annual movement amount may gradually increase (as it has since 2005), likely exceeding a foot or more each year (landslide movement in 2009 exceeded 12.5 inches). However, during extremely dry years, such as 2007 and 2012 thus far, movement may be slow or even suspend, and a prolonged dry period, such as a multi-year drought, may cause the landslide to become dormant (no movement for over a year). However, because of the uncertainty in predicting the weather and water infiltration in future years, residents should prepare for future movement of the landslide, particularly given that significant damaging movement occurred in 2008, a year with near normal precipitation. Due to the slow rate of landslide movement, the UGS plans on monthly to quarterly groundwater and ground-deformation monitoring and periodic GNSS monitoring of the Springhill landslide when conditions revealed in the monitoring warrant. If precipitation amounts increase significantly, monitoring frequency will likely increase. Residents should be aware that excessive summertime landscape watering may cause groundwater levels to rise, which may cause an increase in the rate of movement. The observed rise in groundwater level in late April and May, 2009, and in late June, 2010, in observation wells P-1 and P-4 may have been caused, at least in part, by local landscape watering. The temporary rise in groundwater level caused by landscape watering interrupts the natural decline that generally occurs in the summer and early fall, leaving the level higher at the end of the year than it would have been without landscape watering. This will result in a higher groundwater level in the following year, and thus, less snowpack is needed to cause a similar rise in groundwater levels as in the previous year, increasing the likelihood of future damaging movement. In addition to landscape watering, residents should also watch for broken water pipes and sewer lines and report (if municipality owned) or fix them immediately to prevent excessive water infiltration into the landslide.